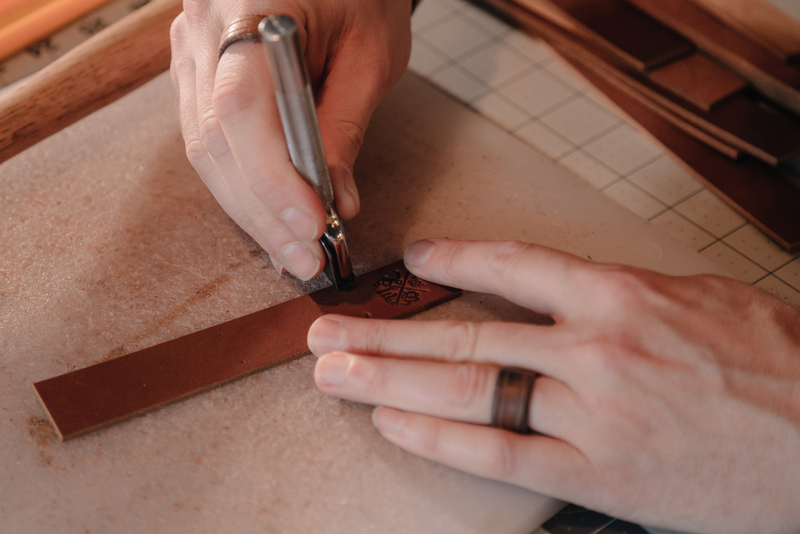 There is no mistaking the feel of well-crafted hand-made leather goods. 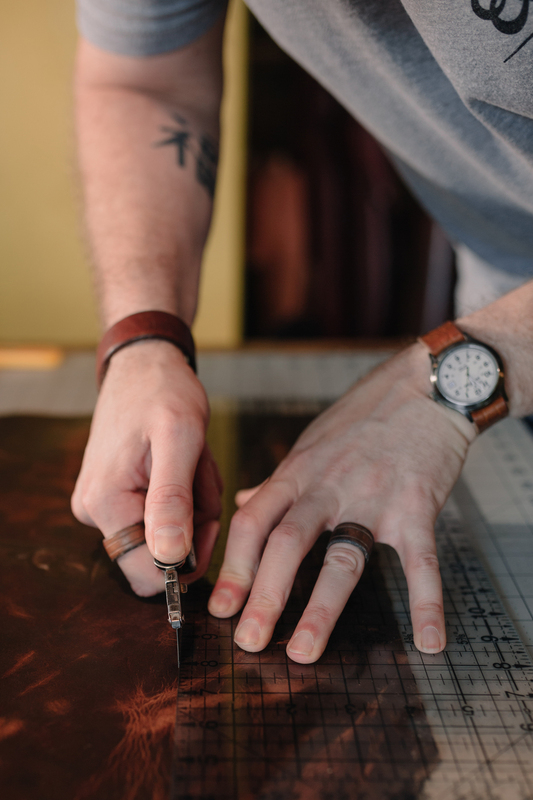 Ian Norris, founder of Wilde-Moon Leather, captures the timeless charm and tangible artistry of high quality leather products. 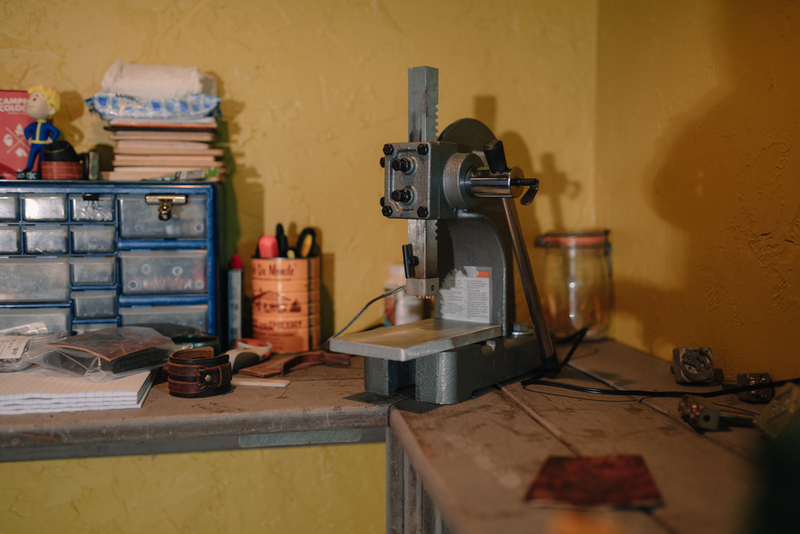 After moving to from England to Oklahoma, Norris turned a passion into a profession by launching Wilde-Moon Leather in 2014. 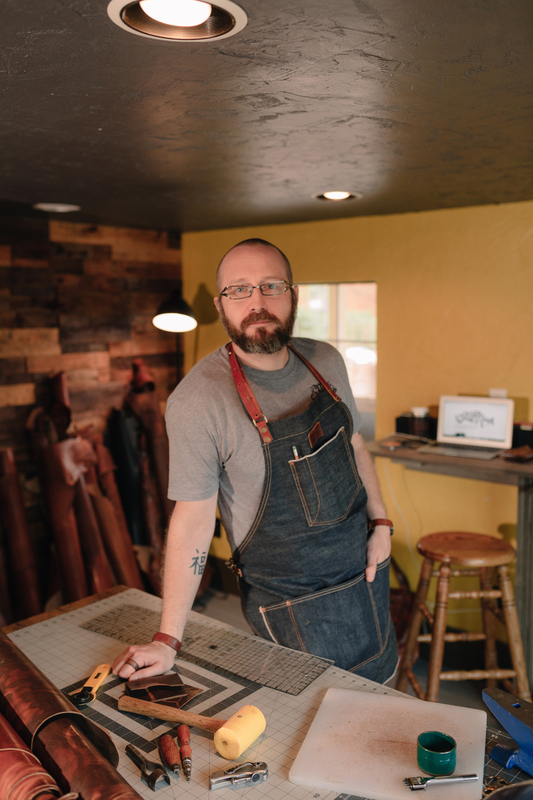 The shop runs out of a small one-room studio space in Edmond, owned by Norris’ friend Jonathan Marks, co-owner of Aegis Roofing. Norris has found a way to spend every day doing what he loves: creating products that leave an impression and last a lifetime. 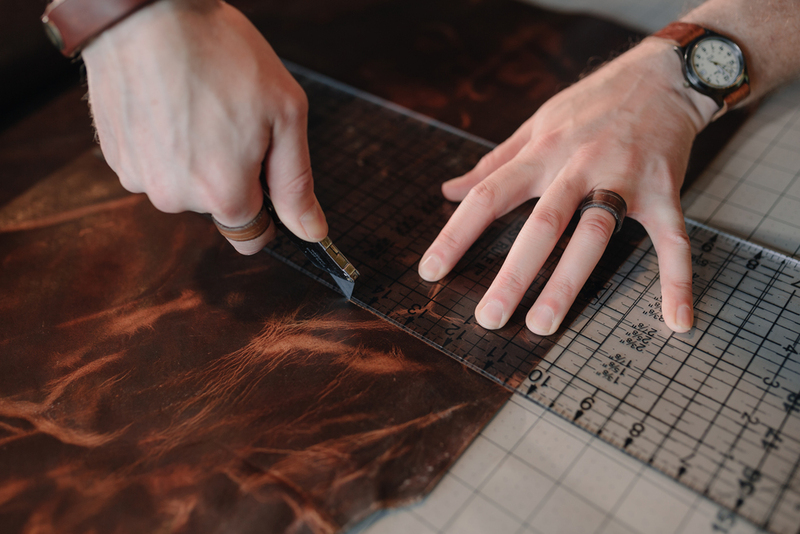 How did you get involved in making leather goods? I was actually forced into it by a friend. When I first moved to Oklahoma, I worked on a ranch in Western Oklahoma. I was a ranch hand, and I was responsible for 250 head of cattle and 2800 acres of land. It was a complete change from what I’d ever done before. The last 15 years of my career was publishing, and I was a photographer and involved in advertising and marketing. I learned a lot of practical skills out on the ranch. I had a friend in Arizona who made leather goods and he kept telling me he thought I’d be really good at this kind of thing, just because I’m reasonably practical. In the end, just to appease him, I bought leather and some little tools and I started experimenting, fooling around, making key chains and little wallets. Anyway, I posted one set onto my Instagram and a whole bunch of people wanted to buy one. I put them up for sale on an Etsy shop, sold them all in a day and made $400. I made some more wallets and sold them all. What was first a hobby, something that I wasn’t even particularly wanting to do, became a hobby that paid for itself that then enabled me to invest in the high quality leather that I use today. Now it has become a real business, and I am able to provide for my family from it. Why did you move to Oklahoma? My wife. We’ve been married for seven years now. When we first met, I spent two years traveling back and forth from England. We met through Facebook, but it’s not quite as terrible as that. We have a mutual friend in England that thought we would get along well. I didn’t think there was a point since she lived in America. She friend requested me on Facebook and I had a firm rule on Facebook that I wouldn’t accept a friend request from anyone that wasn’t actually my friend. At the time, I did a lot of mountain biking and hiking, she saw all of that. She asked if we could Skype and I said “yeah, okay fine.” As a joke, she said it would be funny if I came over for a vacation, and a few months later I came to Oklahoma for a two-week holiday. I spent the next two years flying back and forth constantly, I would come to America every 8 to 12 weeks for a mini-holiday. Eventually, I just came over one time and stayed. And now it’s seven years later. Where did the name Wilde Moon come from? My sons. Harvest Moon (4) and Everett Wilde (2) are my two youngest boys so I decided to call it Wilde-Moon in the hopes that later they might want to get involved. Or at least I can teach them how to do it so they can make their own decision about it in the future. I like it all. I don’t know, that’s a really hard question because I love what I do. None of the products are a chore, if that makes sense. But I do like it when I get challenged with custom work. What’s your favorite part of the creation process? My favorite part is actually coming up with new ideas and having to figure out how to make it work. Especially with custom projects, people will come to me with these crazy ideas and initially there’s no way I can see how it’s viable. So I’ll spread out a big roll of leather and just fold it around and think about how to make it work. It’s really a fun challenge because when you’ve got set products that you make, you know how to do that and you know the process. Recently I made a clutch-style wallet for a lady who wanted the front flap to be in the shape of Oklahoma. It was a challenge trying to figure out how to get it to work, but it was fun. The best part of the process is figuring out to create something when it seems impossible. What's the piece you’re most proud of? There are so many custom orders that have been so cool. I like all the pieces that I sell, and I would use every single product that I make. I’d say the three products I use the most in my every day life are the reverse wallet, the phone sleeve with card slots on the front, and the notebook holders/wallets. The products I use are the first ones I’ve ever made. I think my proudest moment was getting the National Parks Foundation as a client. We came up with an idea that was very specific to their needs and now I make notebooks for National Park passports. Because of this, my stuff is out there and being used on a daily basis in the kind of environments that they are made for. Occasionally a customer will ask if I can make the design for them, but they are exclusively made for the National Park Foundation. I get most of my inspiration from experience. I’ve done a lot and I’ve experienced a lot through my years. 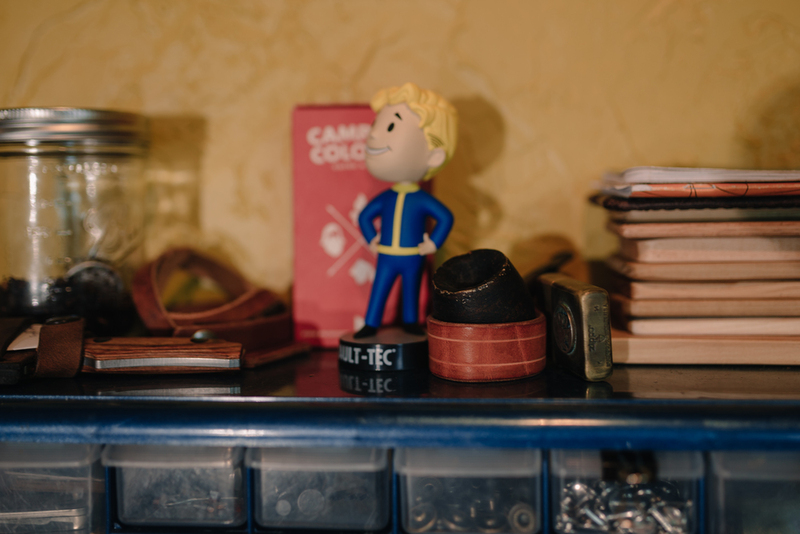 When I started making leather goods as a business, I made products that I would have wanted to use at certain times in my life. Like when I was doing my cross-country mountain biking trips in my late 20s, I wish I had something smaller that could just hold my credit cards. My belts, for example, I got tired of buying a new belt every year so I just decided to make a really good belt. Also, there are a few other leather workers that I am good friends with in different parts of the country and we knock ideas off each other. I get a lot of inspiration from those guys, too. I don’t really have any spare time; I am basically a part-time stay-at-home dad that works on this stuff when my wife is home. But if I could, I would be mountain biking and hiking and anything to do with being outdoors. It will be the only one you’ll ever need. I make my products in such a way that they become heirloom products. If you take care of a wallet, when you have kids, you’ll be able to give it to your kids when they grow up. You won’t need another one unless your lifestyles demands something bigger or smaller. When you feel it, you know it. Wilde-Moon Leather products and custom goods are available for purchase at www.wildemoonleather.com.